Born in 1968 in Leningrad. On graduating from the Moscow Ballet School (1986, teachers — Pyotr Pestov, Anna Markeyeva), he joined the Kiev Shev-chenko Theatre of Opera and Ballet as soloist where, from 1986-92 and 1995-97, he danced the lead roles in the following, among other, ballets: The Sleeping Beauty, Swan Lake, The Nutcracker, Giselle, Cinderella, La Fille mal gardee, Cipollino. In 1992-1995, he was soloist with the Royal Winnipeg Ballet (Canada), where he danced in ballets by George Balanchine, Frederick Ashton, Antony Tudor, John Neumeier, Rudi van Dantzig, Twyla Tharp and others. He has made guest appearances with the Bolshoi Theatre, National Ballet of Quebec, Imperial Russian Ballet Theatre of Pantomime in Tivoli (Copenhagen). From 1997, he was soloist with Royal Danish Ballet where he appeared in the following ballets by August Bournonville: La Sylphide, Napoli or The Fisherman and His Bride, A Folk Tale, The Kermesse in Bruges, La Ventana; he also danced in Rudolf Nureyev's Don Quixote, George Balanchine's Symphony in C and Jewels, Serge Lifar's Suite en blanc, Jerome Robbins' The Concert, Kenneth MacMillan's Manon, John Neumeier's The Odyssey, Maurice Bejart's Gaite Parisienne, Mats Ek's Grass, N. Duato's Jardi tankat. 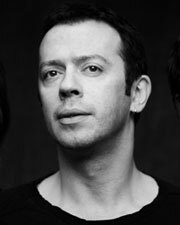 He has worked with the following choreographers: Mats Ek, Jiri Kylian, John Neumeier, Maurice Bejart, Peter Martins, Kevin O'Day, Stanton Welch. He was the creator of roles in the following ballets: Reflections and Darkness Between Us by Mark Godden, Sweet Complaints, Refrain, Dominum, The Nomads by Tim Rush-ton, Shostakovich op. 99 by Anna Laerkesen. He partnered Maya Pli-setskaya in Nijinsky's ballet, L'Apres-midi d'un faune. As soloist he was awarded the Vaslav Nijinsky prize at the Independent Diaghilev Ballet Competition in Moscow (1992). From 1988-92, he studied at the Choreographers' Faculty at The State Institute of Theatre Arts (GITIS). He is the author of over twenty ballets, among which are: A Fairy's Kiss to music by Pyotr Ilych Tchaikovsky (1994) — Kiev Theatre of Opera and Ballet; The Charms of Mannerism to music by Richard Strauss (1997) —Postmodern-Theatre; Capriccio to music by Igor Stravinsky (1997) —Bolshoi Theatre; Dreams of Japan (1998, awarded the Golden Mask National Theatre prize) — Bolshoi Theatre and Postmodern-Theatre; A Fairy's Kiss to music by Pyotr Ilych Tchaikovsky, Middle Duet to music by Y. Hanin, A Poem of Ecstasy to music by Alexander Scriabin (1998) — all at the Mariinsky Theatre; Turandot's Dream to music by Paul Hindemith, (2000) — Danish Royal Ballet; Flight to Budapest to music by Brahms, (2001) — International Ballet of Copenhagen (2001); Lea to music by Leonid Bernstein (2001) — Alexei Fadeyechev Theatre of Dance (Moscow); he has also mounted productions of the following ballets: The Nutcracker (2001) — Royal Danish Ballet (2001); Cinderella (2002) — The Mariinsky Theatre; Igor Stravinsky's The Firebird (2002) — Royal Swedish Ballet, D. Shostakovich's The Bright Stream — Bolshoi Theatre (2003), Saint-Saens's Carnaval des Animaux (2003, San Fransisco Ballet), Anna Karenina to music by Schedrin (2004, Royal Danish Ballet), Leah to music by Bernstein — Bolshoi Theatre (2004), D. Shostakovich's Bolt — Bolshoi Theatre (2004). Knight of the Order of the Danish Flag (2002). From 2004 — Artistic Director of Ballet of Bolshoi Theatre.